Kentucky State University will remain the lead institution for aquaculture in Kentucky, and one of the premier programs in the nation. Involvement of on-site students in relevant, real-world research will continue. Outreach through video and Web-based courses will be expanded. The Division of Aquaculture at Kentucky State University offers a Master of Science degree in Aquaculture/Aquatic Sciences. Aquaculture is the rearing of aquatic organisms under controlled or semi-controlled conditions. Interest in aquaculture has increased worldwide as fish consumption has increased concurrently with decreasing catches of wild fish. In Kentucky and the southern United States, aquaculture production focuses on raising freshwater species commercially. The curriculum meets criteria established by the University Programs Standards Committee of the American Fisheries Society for Fish Culture Specializations and criteria established by the United States Aquaculture Society, a chapter of the World Aquaculture Society. This program is designed to provide students with the training and experience required for immediate employment. However, the program also is designed to provide the academic foundation for further graduate studies. As a thesis-based degree program, it requires each student to have a graduate committee. This committee will be responsible for evaluating the student’s competencies based on comprehensive evaluation, and thesis presentation and defense. Upon completion of the program, students should have knowledge of production and reproduction of primary aquaculture species, basic genetics, physiology and nutrition of aquatic vertebrate and invertebrate culture species, mechanics and operation of primary production methods, causes and controls of pathogenic organisms, the function and manipulation of biological and chemical cycles in ponds, the design and analysis of experiments, and basic economics and marketing in aquaculture. Aquaculture is the rearing of aquatic organisms under controlled or semi-controlled conditions. Interest in aquaculture has increased worldwide as fish consumption has increased concurrently with decreasing catches of wild fish. 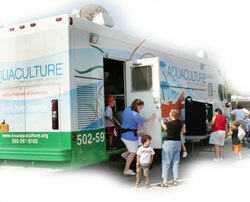 In Kentucky and the southern United States, aquaculture production focuses on raising freshwater species commercially. Aquaculture instruction at Kentucky State University will provide students with basic knowledge in fish nutrition, diseases, and physiology, as well as practical experience in aquaculture production of freshwater aquatic organisms such as catfish, paddlefish, freshwater shrimp, and others being studied at the University’s aquaculture research facility. Courses in the minor are taught by faculty who are active researchers in the University’s aquaculture program. The minor provides training sufficient to support further study at the graduate level and enough practical aspects for the student who plans to enter the work force immediately upon graduation. A minor in Aquaculture requires the completion of 19 semester credit hours. Specific course requirements include AQU 411, 421, 422, 460 and at least one semester credit hour of AQU 491. The remaining one to four semester credit hours required for a minor in Aquaculture must be satisfied by completing one or more additional Aquaculture courses. The goal of the KSU Aquaculture Research Program is to increase the knowledge-base in aquaculture, and thereby facilitate increases in farm income and the productivity of on-farm water resources in Kentucky and around the world. This is to be accomplished by examining and developing production technologies suitable for the climatic and physiographic conditions prevalent in Kentucky and similar regions. To meet these goals, the KSU Aquaculture Research Program’s initial studies were directed toward the development and adaptation of pond and cage-culture techniques for channel catfish and trout, as the principal species of the Kentucky fish-farming industry; however, the USDA expects newly developing aquaculture species to experience rapid expansion in the next decade by adapting existing production and processing systems already developed for catfish and trout. Development of these species is expected to occur largely in states, like Kentucky, which do not currently have well-established production, processing, or marketing infrastructures for aquaculture. The intent of the program’s research, extension, and education activities is to assist Kentucky producers in this future development by investigating alternative aquaculture species that can be produced profitably in Kentucky. Species evaluated over the past several years include blue catfish, walleye, yellow perch, brook trout, hybrid bluegill, largemouth bass, paddlefish, tilapia, freshwater prawn, crappie, sturgeon, hybrid striped bass, and red claw crayfish. The KSU Aquaculture Program is widely recognized as being the lead program nationally and internationally in the areas of paddlefish culture, freshwater prawn culture, production of largemouth bass on-feed, and fish meal replacement research for catfish and hybrid striped bass. Research information is of little practical value unless it is communicated to producers in a useful and understandable form. Training and extension programs serve as the primary means of transferring this knowledge from the researchers to the end users. KSU Aquaculture Specialists are integrated into the UK Cooperative Extension System. KSU Specialists are housed in western and central Kentucky. Dr. William Wurts is at the UK Princeton Research and Extension Center, and Mr. Forrest Wynne is in the Purchase area of western Kentucky where he assists and supports the rapidly growing catfish industry. Dr. Robert Durborow is in central Kentucky at KSU’s Aquaculture Research Center. Extension specialists recorded over 100,000 extension contacts during 2005-2006. The Division of Aquaculture is the only program at KSU that addresses all three of the traditional Land Grant university roles: research, teaching, and extension. Research and extension responsibilities are administratively housed within the Land Grant Program under the supervision of Dr. Harold Benson, Director of the Land Grant Program. Academics are administratively housed within the Division of Aquaculture, which is supervised by a Division Chair, Dr. James H. Tidwell. The Division is a unit within the College of Math, Science, Technology and Health, administered by the Dean, Dr. Charles Bennett. Both the Land Grant functions (research and extension) and the academic functions are supervised by the Vice-President for Academic Affairs and Provost, Dr. Juanita Fleming.